WINNIPEG, May, 31, 2016 /CNW/ - A new study led by Canadian astronomers provides unprecedented insights into the birth of stars. Using observations from the Green Bank Telescope in West Virginia and the Hawaii-based James Clerk Maxwell Telescope in the United States, astronomers from the National Research Council of Canada (NRC) have discovered that star formation is more regulated by pressure from their surroundings than previously thought. The birth of stars occurs deep within dense concentrations of interstellar gas and dust—known as cores— when their internal support structure becomes overwhelmed. These cores typically contain several times the mass of the Sun over a region about 10,000 times the size of the Solar System. Cores are deeply embedded within molecular gas clouds which are located throughout our Milky Way Galaxy. Although dust within cores hides the earliest stages of star formation from view of optical telescopes, observations with specialized radio telescopes can peer through the dust to study their dynamic nature. 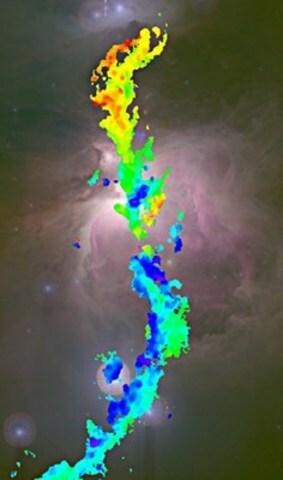 The Gould Belt Survey from the James Clerk Maxwell Telescope identified the locations, sizes, and masses of cores across the Orion A cloud while the Green Bank Ammonia Survey detected the motion of gas molecules within the clouds. "By combining this data, we've learned that most Orion cores are gravitationally bound, and so they will likely one day collapse to form stars," says Dr. Helen Kirk, the astronomer with the National Research Council who led the study. "Intriguingly, ambient material from the surrounding cloud appears to be squeezing the cores by an amount larger than the gravity of the cores themselves." Earlier analyses of cores often ignored the ambient cloud pressure, but this new work suggests that it is a key ingredient in understanding the futures of cores. "This suggests that clouds within our Galaxy are themselves likely under pressure to form stars," Kirk concluded. "The motions of interstellar gas (foreground) seen in contrast to the optical view of the Orion molecular cloud (background)."